Imagine this beautiful pet gate in your home. 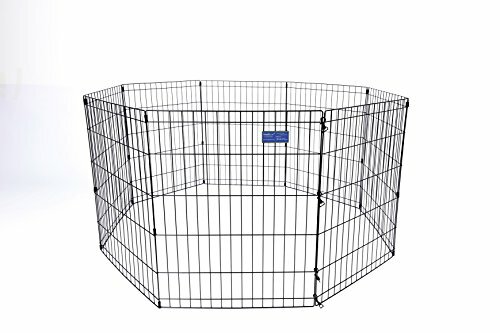 It's designed to keep your pet safely confined in most areas while allowing you to move freely about. Simply Plus Exercise Pen / Pet Playpen is designed to easy to set up and break down so you can bring your pet anywhere you want to go. Simply DIY the shape as you see fit, and enjoy a variety of options.Plus, it has plenty of room for playing and keeping active while staying safe within the boundaries of this playpen. Carefully selected metal material is durable black e-coat finish on the Exercise Pen / Pet Playpen provides long lasting protection against rust and outdoor elements, keeping your pet safely confined in his/her "special" area. The black Exercise Pen / Pet Playpen by Simply Plus for Pets consists of 8 - 24" wide panels and is available in 3 different heights. When fully expanded, the Exercise Pen / Pet Playpen provides your pet with 16 square feet of enclosed living area. Suitable for the dogs, duck, rabbits, and other farm animals. Plenty room for playing and keeping active while staying safe within the boundaries of this playpen. 8-panel design allows for multiple shape configurations. Easily Sets Up & Folds Down,includes Ground Anchors for outdoor use. Great for indoor or outdoor use / W24" x H24" each panel. If you have any questions about this product by Simply Plus, contact us by completing and submitting the form below. If you are looking for a specif part number, please include it with your message.